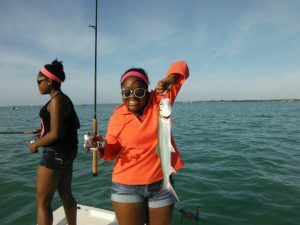 Many visiting anglers who come to Sarasota choose to go out on Siesta Key Beach fishing charters. 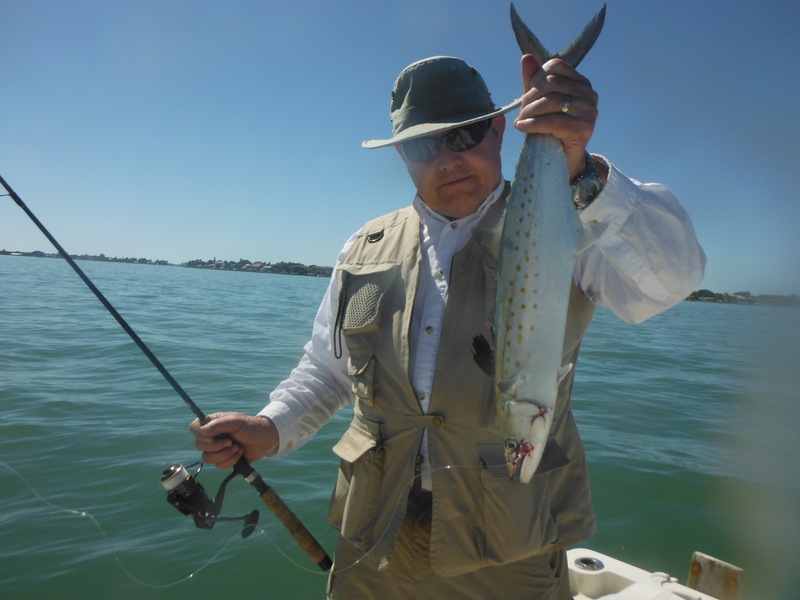 The waters off of Siesta Key offer clients a wide variety of fishing opportunities. Capt. 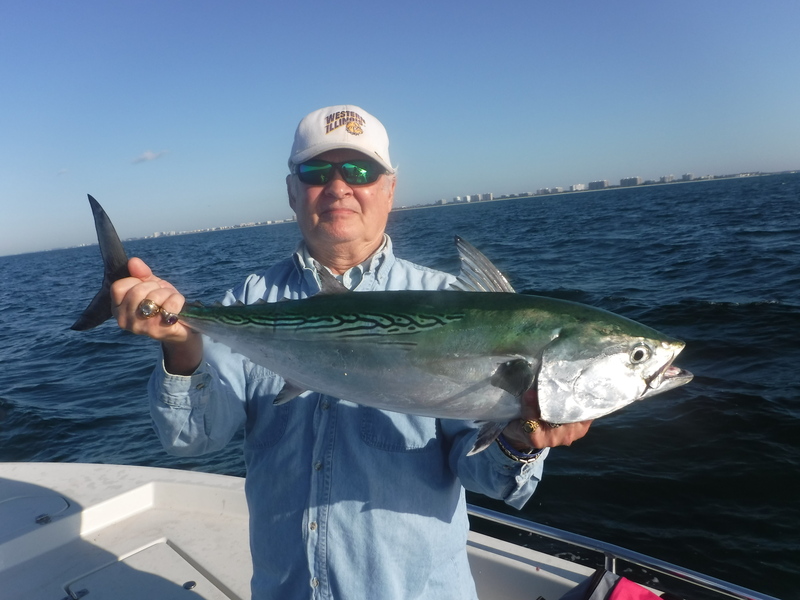 Jim Klopfer has been running Siesta Key Beach fishing charters since 1991. He is very well-rounded and chooses the type of fishing based on the clients experience and expectations. Drifting the deep grass flats of Sarasota Bay will produce speckled trout, Spanish mackerel, bluefish, pompano and more. Both passes have excellent bottom fishing for sheepshead and snapper along with drifting for ladyfish, mackerel, and pompano. Experienced anglers may choose to target the mighty snook along mangrove shorelines. 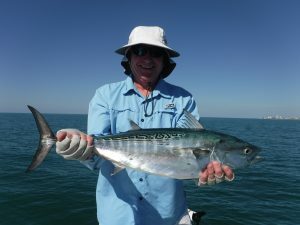 Mackerel action can be fantastic in the inshore Gulf of Mexico. Siesta Key is a resort island on the south end of the city of Sarasota. It lies on the West Coast of Florida, just south of Tampa. Siesta Key Beach is famous for its powdery white sand. However, it offers visiting anglers some excellent opportunities to catch a wide variety of species using multiple techniques. Many of the anglers who go out on Siesta Key Beach fishing charters are inexperienced. This includes both children and adults. Much of the fishing that is done does not require great casting skill or a lot of experience. Light spinning tackle is primarily used, which is easy to learn even for the novice. 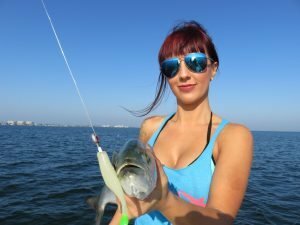 Casting, drifting, trolling, and bottom fishing are all techniques that are used to produce fish for clients. Anglers seeking action and variety will do well to target the deep grass flats. This type of fishing is done on the majority of Siesta Key Beach fishing charters. Sarasota Bay is quite flat and relatively featureless. Submerge grass beds are the primary cover for bait fish and crustaceans. This in turn attracts the game fish. Submerged flats in 6 feet of water to 10 feet of water hold a variety of fish. 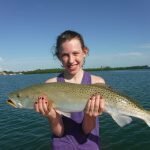 Speckled trout, pompano, bluefish, Spanish mackerel, jack crevalle, grouper, snapper, ladyfish, and more are taken regularly on the deep grass flats. Drifting is the preferred technique when fishing the deep grass flats in Sarasota Bay. Many of these areas are quite large. Drifting with the wind and tide allows anglers to cover a lot of water in search of schools of fish. Once fish are located, anglers and concentrate on that area. It is best to find a flat to drift where the wind and tide are moving in the same direction. Live bait works well when drifting the grass flats on Siesta Key fishing charters. Live shrimp are available all year round and work well on just about every species. Live shrimp can be free lined out behind the boat with little or no weight. This works best in deeper water. In shallower water, the shrimp can be fished under a noisy float. The float both signals a strike and is used to attract fish. Live bait fish can also be used with great success on the Sarasota grass flats. In the summer time, huge schools of small silvery bait fish flush into the bay. They are easy to catch on the shallow flats near both passes. Once obtained, they can be used as chum to attract fish up behind the boat. This is a deadly technique that regularly produces 100 fish days. Live pin fish and grunts can also be floated back behind a drifting boat. Artificial lures are very productive for anglers drifting the grass flats as well. They will often times out fish anglers using live bait. Artificial lures allow anglers to cover much more water than they can with live bait. Lures will also trigger bites when fish are not in a mood to feed. Lures are cast out ahead of the boat as it drifts across a likely grass flat. 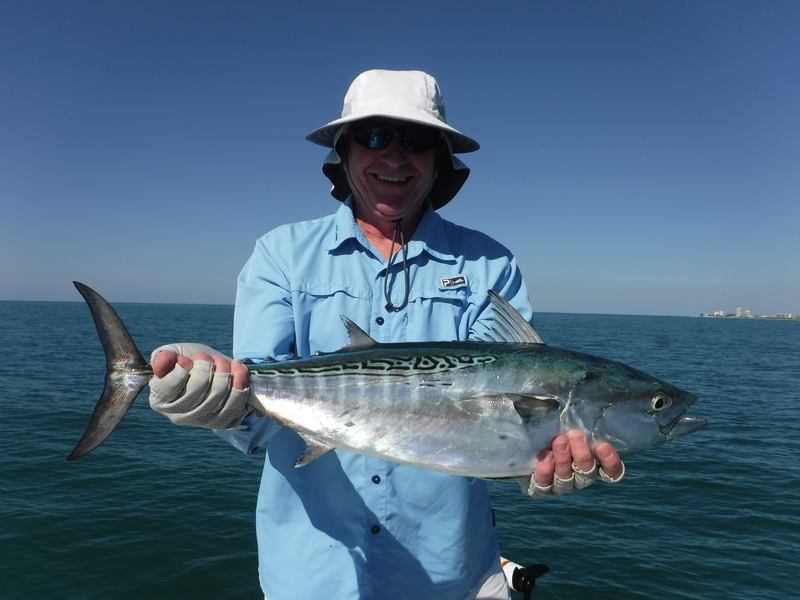 The number one artificial lure for anglers on Siesta Key fishing charters is the jig and grub. This consists of a lead head jig with some type of plastic grub body. A 1/4 ounce jig head is the preferred size. Tails come in a myriad of sizes, shapes, and colors. Most of them mimic either a bait fish or some type of crustacean. Scented grubs can make the difference on days when the bite is tough. Spoons are another effective artificial lure. 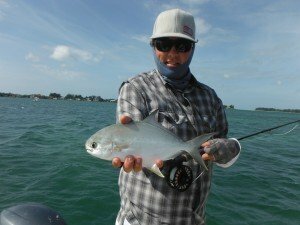 Silver is the most popular color in the clear waters of Sarasota Bay. 1/2 ounce spoons are the most often used size. Spoons cast a very long way and put out and enticing flash and wobble. Spoons are very effective on bluefish, Spanish mackerel, jacks, and ladyfish. They are especially productive when fish are feeding on the surface. Plugs are another very effective artificial lure. They imitate small bait fish and can be cast out ahead of the drifting boat. Plugs are also very effective when trolled and are great way to help locate fish in a large area, particularly when there is no wind. Plugs do have a couple drawbacks. They are relatively expensive. Also, anglers must take great care as most plugs have multiple treble hooks. 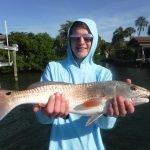 Both Big Sarasota Pass and New Pass can be excellent fishing spots. Passes are basically inlets that connect the Gulf of Mexico with Sarasota Bay. These are virtual fish highways that many species use to migrate between the two bodies of water. Passes have excellent current flow along with abundant structure. This results in an outstanding fishing spot! 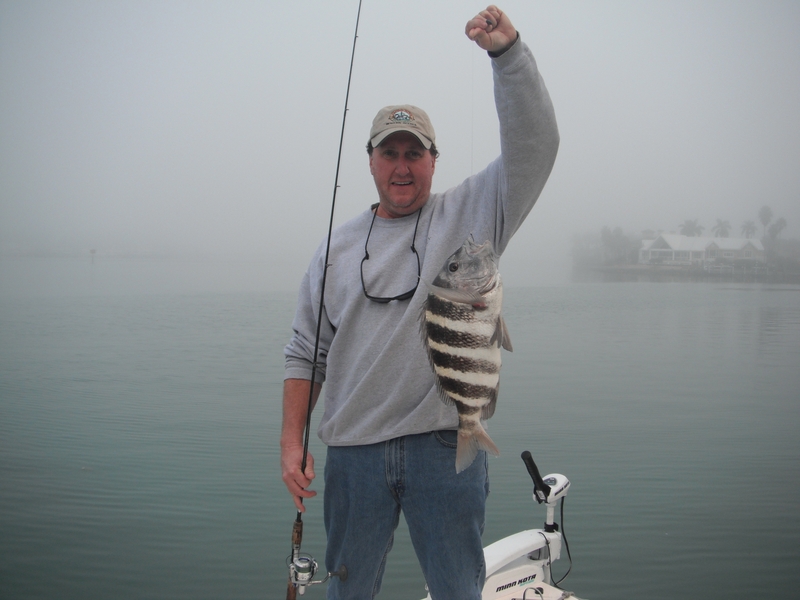 Bottom fishing for sheepshead in the passes is a staple on Siesta Key fishing charters. These tasty saltwater pan fish show up in January and stay until early April. Anglers fish live or frozen shrimp right on the bottom near rocks, docks, seawalls, and other structure. 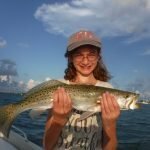 This is a great technique for anglers with little experience and for kids as it is relatively easy and very productive. Grouper and snapper are landed as well. Fish are also caught in the open waters of the passes as well. Pompano, ladyfish, Spanish mackerel, and bluefish are caught by anglers drifting with both live and artificial bait. A live shrimp drifting out behind the boat either free lined or on a jig head can be very productive. Vertically jigging in the deeper water is another great technique. Anglers also cast to breaking fish as they feed on the surface. Anglers with more experience who seek bit more of a challenge may choose to targets snook, redfish, and jacks. Clients who go this route will not catch as many fish, however, they will usually catch larger ones. This is a “quality over quantity” situation. Both live bait and artificial lures can be productive, depending on the time of year. These species are rarely found in the open waters as speckled trout and other species are. They are much more are structure oriented and are usually found around mangrove shorelines, docks, oyster bars, and bridges. Both Roberts Bay and Little Sarasota Bay lie on the east side of Siesta Key and offer miles of this prime habitat. Artificial lures are often used by anglers targeting these species on Siesta Key Beach fishing charters. Shallow diving plugs, we list spoons, and soft plastic baits are most commonly used. These fish can often be found in water as shallow as a foot deep. Lures that will run shallow in the water column are required. Lures allow anglers to cover miles of mangrove shoreline and oyster bars on a fishing trip. 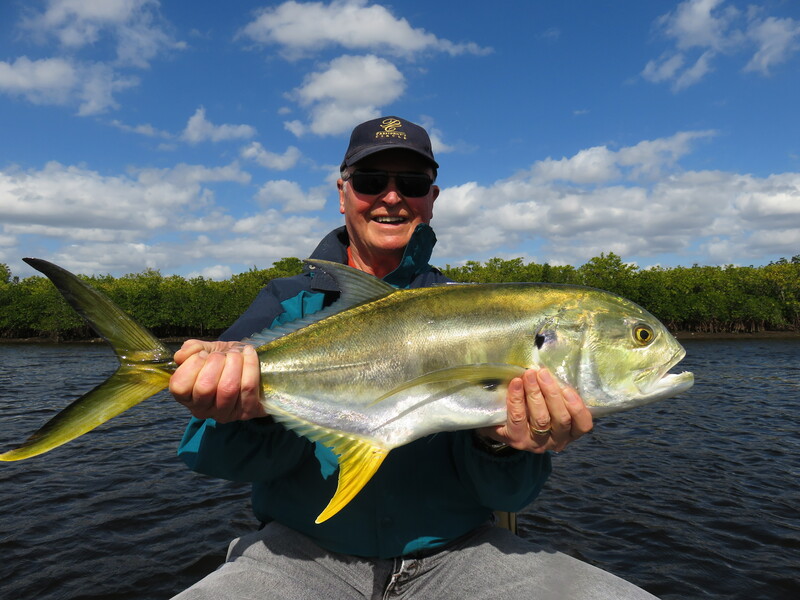 In the wintertime, snook and jacks migrate up into Siesta Key residential canals and creeks. Phillippi Creek is a terrific wintertime spot for both species. Anglers casting plugs towards shoreline cover and docks will usually experience success if they are persistent. Trolling with plugs can also produce some nice fish. Live bait is also used when targeting snook, reds, and jacks. Jumbo live shrimp are very effective in the cooler months when pitched underneath a dock. 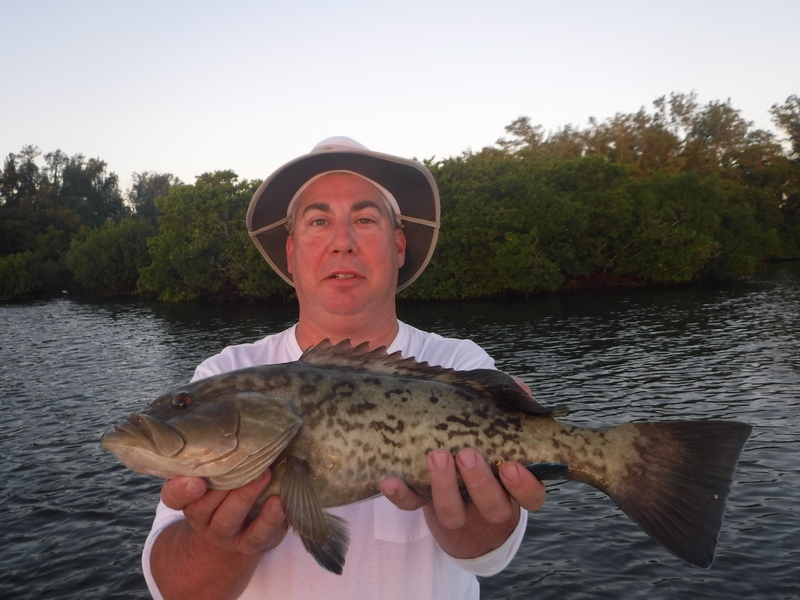 Chumming with live bait fish along mangrove shorelines and near docs is extremely effective. This is the best way to catch numbers of fish and is a technique employed whenever the bait fish are available to be caught. Action and the inshore Gulf of Mexico can be nothing short of amazing when conditions are right! Several days of East wind will have the waters close to shore clear and calm. This will attract huge schools of bait fish which in turn will attract Spanish mackerel, king mackerel, false albacore, sharks, and more. Often times, game fish can be seen feeding voraciously on the surface. This type of visual fish and is extremely exciting. Casting artificial lures to breaking fish is great fun. 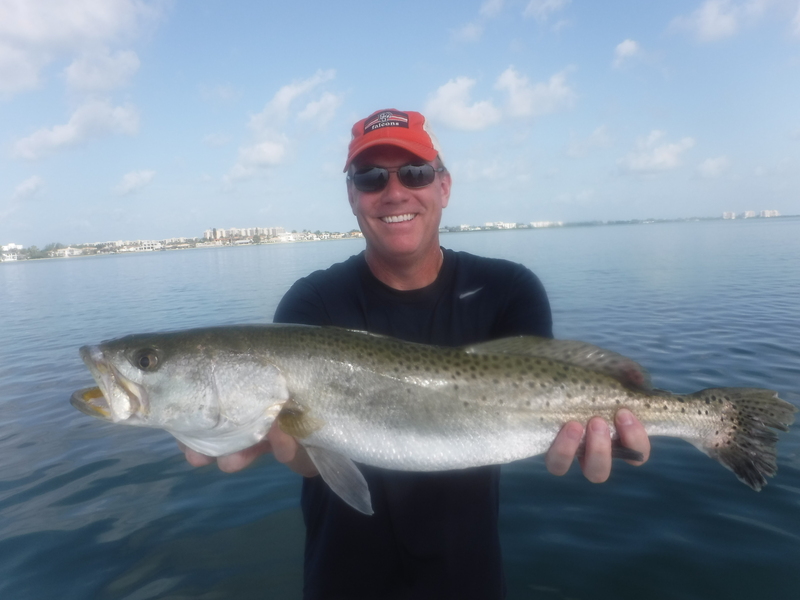 This type of fishing is done on Siesta Key fishing charters whenever conditions allow. This most often occurs in spring and again in the fall when the water temperature is in the low 70s. 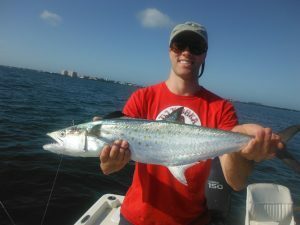 Spanish mackerel are usually abundant and are easy to catch by anglers casting jigs, spoons, and plugs. False albacore are a bit more challenging, but are incredible sport. Trolling is an excellent way to locate and catch fish when they're not working on the surface. This is another technique that requires very little angling experience by clients. No casting is required as the boat drives around dragging lures in search of fish. 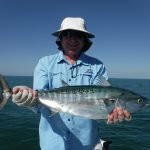 Spanish mackerel are most often caught, but it is not at all unusual for larger king mackerel to be landed just a few miles from shore. Small sharks are often times plentiful near the schools of Spanish mackerel. 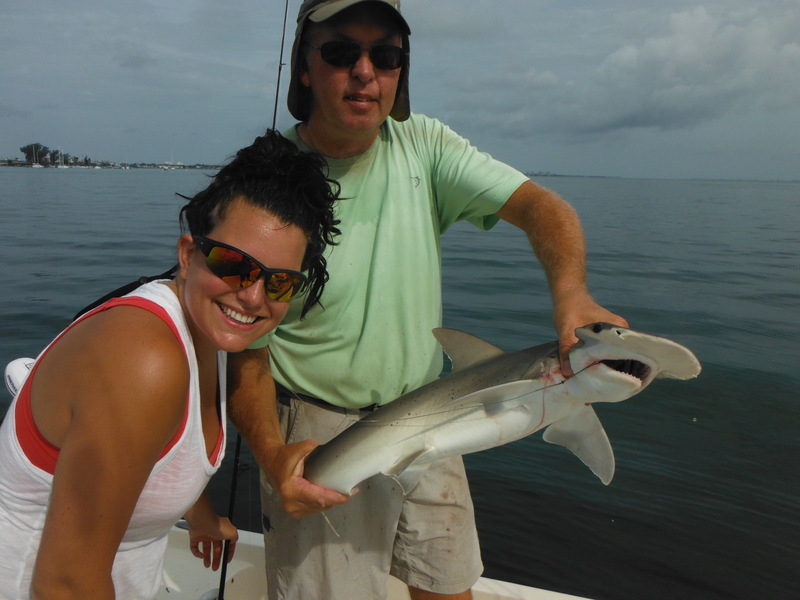 Bonnet head and black tip sharks average around 40 pounds and are great fun on medium spinning tackle. The technique used to catch them is fairly simple; a chunk of' fresh Spanish mackerel is drifted out under a float near the schools of mackerel. If there are any sharks around, it usually does not take long for them to find the bait. There are three artificial reefs within a couple miles of shore just off of the Sarasota beaches. As much of the Gulf of Mexico floor is barren, these reefs attract both bait fish and game fish. They are great place to start looking when fishing the inshore Gulf of Mexico. Pelagic species such as mackerel and false albacore will be found just under the surface. 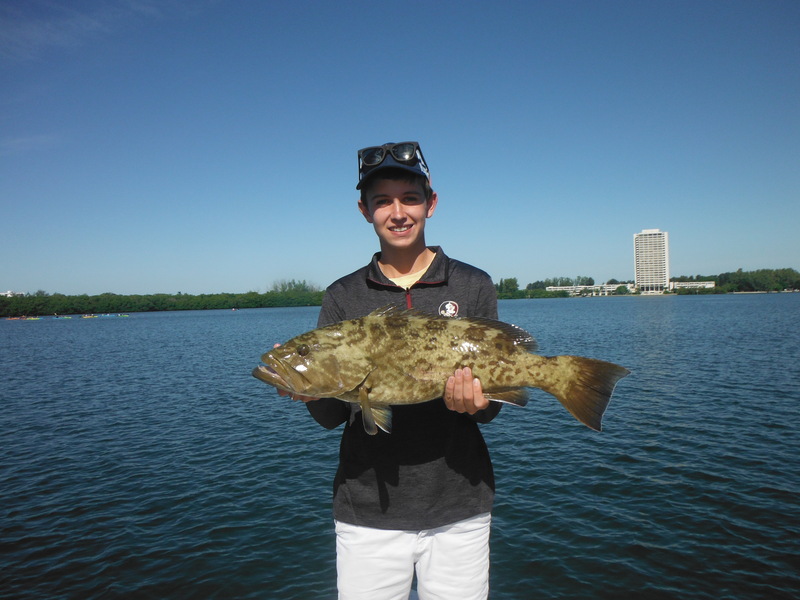 Anglers bottom fishing will catch sheepshead, flounder, grouper, and snapper. Capt Jim offers visiting anglers a unique fishing opportunity; fishing area rivers for snook, bass, and jacks. The Manatee River, Braden River, and Myakka River are within 45 minutes of Siesta Key. All three rivers can offer some fantastic fishing in scenery in the cooler months. As anglers drift with the current in a 14 foot Alumacraft Jon boat, they cast plugs and jigs to likely shoreline spots. This trip is best suited for experienced anglers. Decent casting skills and patience are required. This is definitely not a numbers game. 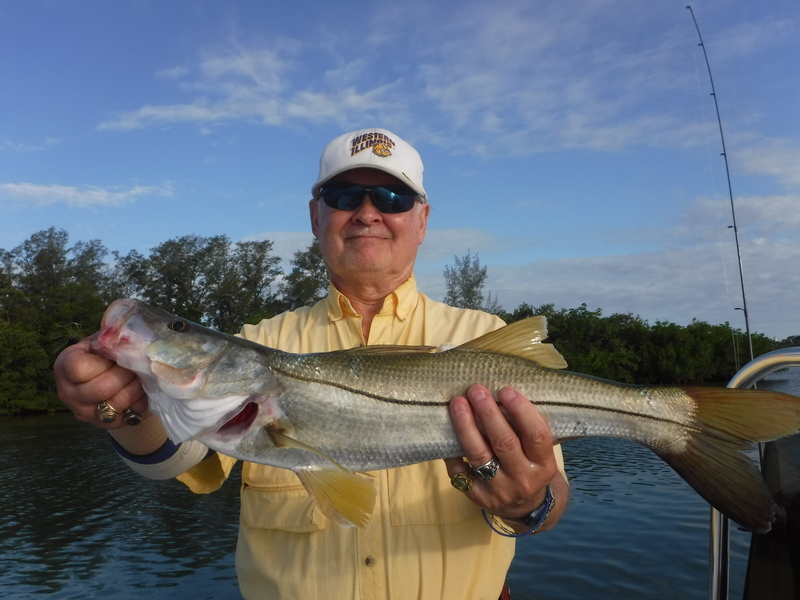 However, patient anglers can be rewarded with the trophy snook of a lifetime. 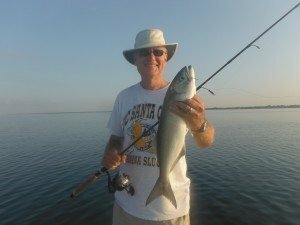 Fish to 30 inches are caught regularly and snook to 40 inches are caught every season. One unique aspect of this is that largemouth bass inhabit the same waters and can be caught as well. Siesta Key in Sarasota offer anglers a wide variety of game fish species that can be caught at one time of year or another. 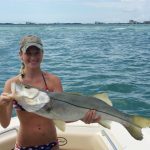 Snook, redfish, speckled trout, Spanish mackerel, bluefish, pompano, jacks, sheepshead, grouper, snapper, tarpon, false albacore, sharks, and ladyfish are all available to be caught by anglers on Siesta Key fishing charters. anglers can find current Florida regulations on the FWC website. 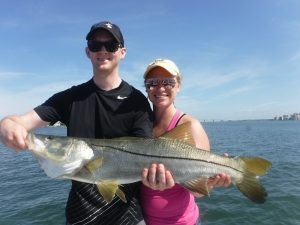 Snook are the most prized inshore game fish in Florida. They are very similar to largemouth bass in that they have a largemouth in a broad tail. They are very powerful ambush predators that are usually found near some type of structure. Docks, bridges, oyster bars, mangrove shorelines, and other structures will all hold snook at one time of year or another. Snook have a distinct seasonal migration. They are normally found up in creeks and residential canals in the cooler months. As it warms up, they move out into the backwater areas to feed. By May, most mature fish will be out in the passes or along the beaches as part of their spawning ritual. By September, the pattern will begin to reverse itself and fish will move back into the bays. Snook can be caught by anglers using both artificial lures and live bait. 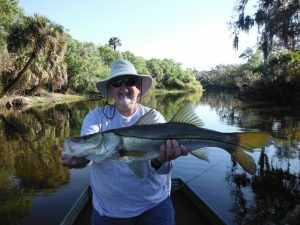 Most effective snook lures were originally freshwater lures designed for largemouth bass, as both fish are similar in habits. Live bait such as large live shrimp, pin fish, grunts, and shiners are also very effective. 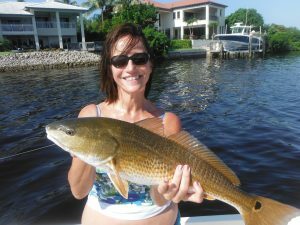 Redfish are another very popular inshore game fish. They are highly regarded, perhaps just a bit behind the mighty snook. Redfish also have a fairly distinct migration pattern. In Sarasota Bay, they are normally found under docks and up in creeks and residential canals in the wintertime. As it warms up, they scatter out across the grass flats in very shallow water. They are often times found in loose schools. By late summer, mature reds usually group up into very large schools before moving out into the Gulf of Mexico to spawn. 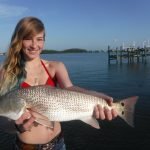 Most redfish in the cooler months are caught by anglers using live shrimp fished under docks and around other structures. As it warms up and the fish move out onto the flats, artificial lures become more productive. Reds are often caught in very shallow water and it can be difficult working a live bait. Artificial lures such as the weedless spoon and soft plastic baits along with top water plugs are better choices when redfish are schooled up on the shallow flats. Speckled trout, or spotted sea trout, are an extremely popular inshore saltwater species in the southeast part of the United States. They are present in decent numbers for anglers on Siesta Key fishing charters. Speckled trout are a schooling species that are most often found on deeper grass flats between 4 feet of water and 10 feet of water. However, the larger specimens are often loners that are found in very shallow water. Anglers targeting speckled trout do well drifting the grass flats. The jig and grub combo is the top artificial lure while a live shrimp fished under a popping cork probably has produced more speckled trout than all other baits and lures combined. 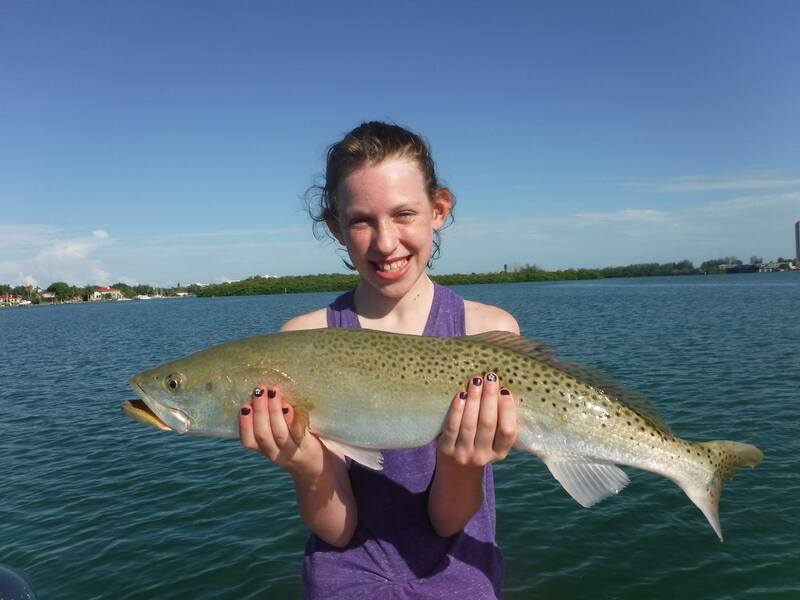 Anglers seeking trophy speckled trout will use a larger live bait such as a pin fish or even better yet, a grunt. These are a terrific, and underrated game fish. They school up tightly in large numbers and are normally very aggressive. They are often times seen feeding violently on the surface. When this occurs, just about any lure or bait tossed into the mix will draw a strike. Trolling is another very effective method, particularly in the inshore Gulf of Mexico. Drifting live baits will produce fish as well. Spanish mackerel are found in the passes, the Gulf of Mexico, and the inshore bays. Bluefish are well known to anglers who fish up in the northeast part of the United States. The bluefish that are caught on Siesta Key fishing charters are smaller, averaging around 2 pounds but growing up to 5 pounds. However, they are normally caught by anglers using light spinning tackle and put up a terrific fight. Bluefish are most often caught by anglers casting jigs on grass flats in deeper water from 7 feet deep to 10 feet deep. They may also be encountered in the passes and out on the beach. Pompano are a beautiful fish that average a couple of pounds but put up a terrific fight for their size. They also happen to be one of the finest eating fish that swims. They are prized by anglers for both of these qualities. Pompano are caught by anglers surf fishing off of Siesta Key beaches as well as by anglers drifting both passes and nearby grass flats. Pompano will readily take a live shrimp. However, most fish are caught by anglers using jigs as this mimics the crustaceans that they feed on. Jacks are the brawlers of the inshore saltwater. They have broadsides, a blunt nose, and a deeply forked tail. They put up a terrific fight and can grow to almost 20 pounds. Jacks are often times seen feeding on the surface. Anglers and countering these feeding frenzies will have an exciting time cast into these large fish. Anglers blind casting to mangrove shorelines, oyster bars, and docks using plugs, spoons, and jigs will encounter jacks as well. They are not considered good to eat. Sheepshead may not be considered a true game fish by some anglers. However, they meet all the criteria. They fight hard, can be finicky, and are terrific eating. Sheepshead are bottom feeders that primarily feed on shrimp and other crustaceans. Very few sheepshead are caught by anglers using artificial lures. Bottom fishing with live shrimp around structure is the most effective technique. They move into the area to spawn, with February and March being the prime months. Gag grouper and mangrove snapper are most often thought of as offshore species. However, they are caught in decent numbers in the inshore waters as well, though most are juvenile fish. Both species are found tight to some type of structure, with docks, bridges, and underwater rocks being the top spots. Live shrimp works well for mangrove snapper and smaller grouper while the larger versions of both species prefer larger live bait fish such as pin fish and shiners. Tarpon are considered to be the ultimate game fish by many anglers. They move into the area in early May and stay until late August. Early in the season, large schools of fish are seen milling on the surface and are sight cast to by anglers using live crabs and bait fish. By mid summer, the fish quit showing on the surface and are most often caught by anglers fishing live baits under floats or cut bait on the bottom. 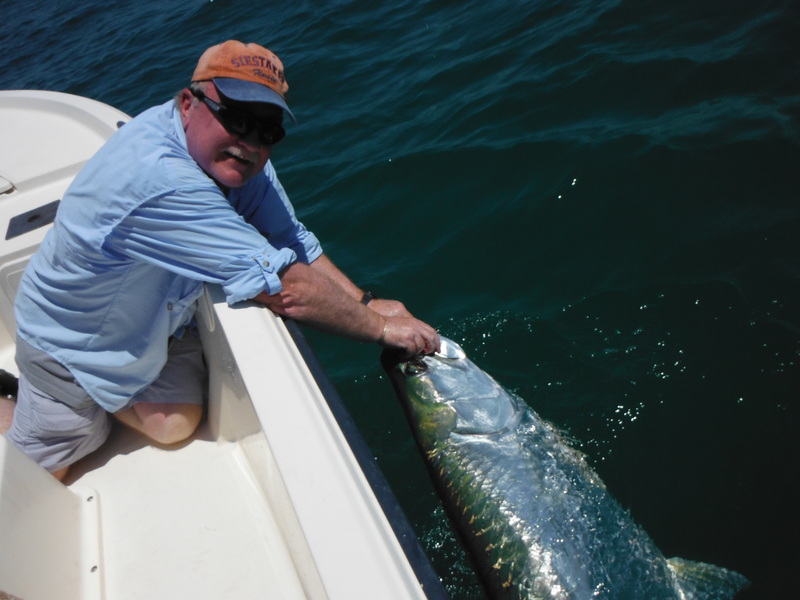 Tarpon fishing is truly big-game fishing and is best for more experienced anglers. False albacore, known locally as “Bonita” are a terrific game fish species. They are caught in the inshore waters of the Gulf of Mexico. At times, they will come very close to shore. However, they are rarely if ever caught in the passes or bays. False albacore can be seen feeding on the surface, churning the water into a froth. Anglers position the boat a cast away and try to get a bait in front of the feeding fish. False albacore can be fussy and move around a lot, and patience is required to catch them. However, no other fish caught by Siesta Key anglers is as fast or as powerful. There are several species of small to medium-size sharks that can be caught by anglers on Siesta Key fishing charters. The best time to target sharks is from mid spring to mid fall. Black tip and bonnet head sharks are the most prevalent species. Though sharks will sometimes be caught by anglers casting artificial lures, cut bait produces the most action. Chunks of oily fish such as Spanish mackerel, jacks, and ladyfish fished under floats in most Sarasota Bay in the inshore Gulf of Mexico will produce these hard fighting game fish. Ladyfish are sometimes disparaged by anglers because they are not good to eat. However, they are game fish in every sense of the word. They hit both artificial lures and live bait with reckless abandon. Once hooked, ladyfish usually leap several times, as highest 3 feet out of the water. They are also fast and put up an excellent fight for their size. Ladyfish school up, and once one is found the action is usually fast. Lead head jig with a grub body and live shrimp are the top baits. In conclusion, this post on Siesta Key Beach fishing charters will help anglers understand all the great fishing options available to them!